DPR’s goal to become indispensable to the communities in which it works was reinforced in the West Palm Beach region recently by one of its key community beneficiaries – the Milagro Center. This fall the Center recognized DPR employee Luke Stocking with an “Ambassador of the Year” Award, while also heralding DPR’s corporate efforts supporting the center’s youth programs with both financial and hands-on support. In addition to Stocking, West Palm Beach office regional leader for DPR, Deborah Beetson, also serves on the Milagro board of directors. 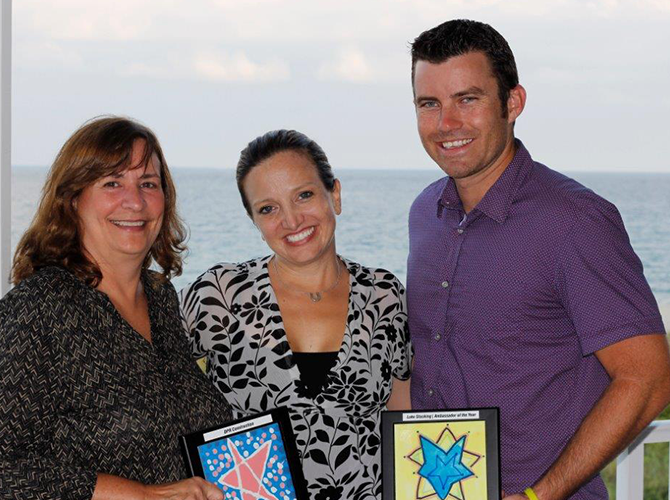 Pictured at the award ceremony are DPR's Theresa Kinsloe, Adriana Martinengo-Rosenberg, and Luke Stocking. Photo courtesy the Milagro Center. Stocking has championed DPR’s efforts with Milagro center for the past two years. The primary efforts in 2015 and those planned for the year ahead are on further growing Milagro Center’s Teen Center and the programs in which local teens participate. He has spearheaded several impactful initiatives that capitalize on DPR's skills over the past year, including a career day with the Milagro teens, a three-session Construction School where youths learned about jobsite safety, power tools and career options, and a project to build and install countertops to create a dedicated homework area for the club. In 2016, plans are in the works for a hands-on workbench design and build in the fall, ongoing career development talks delivered by DPR employees, and a spring project being planned for the Center’s “Star” program serving elementary school age children. DPR hosted a three-session Construction School that introduced Milagro Center youth to many facets of working in construction. Day 1 of the school is highlighted in this video. Photo and video courtesy Adriana Martinengo-Rosenberg. Milagro Center’s mission is to enrich children’s lives through cultural arts, academic support and living values. The nonprofit serves at-risk children, youth and families living at or below the federal poverty level in South Florida.